Included in the giveaway are three items handmade by me: a zipper pouch, a tissue holder, and a coffee cozy. Since this is a follower appreciation giveaway, you must be a follower of my blog to enter, but new followers can enter, too! Just become a follower before entering the giveaway. There's only one way for my followers to enter... Leave one comment on this post. It's that easy! Only one comment per person please. Make sure you leave an email address if your email is not linked to your Blogger profile. I will ship anywhere, so please feel free to enter even if you don't live in the U.S. The giveaway will close at 7:00am (EST) on Friday, February 25, 2011. I will use a random number generator to determine the winner by comment number. I will notify the winner via email. Again, please make sure your email is available to me through your Blogger profile or leave it in your comment. If I am unable to reach the winner by 7:00am (EST) on Tuesday, March 1, 2011, I will choose another winner. Thank you all so much for following Gwenny Penny. I truly appreciate each and every one of you. Good luck! Oh, my! They are gorgeous! I've got to have them! What a generous giveaway. 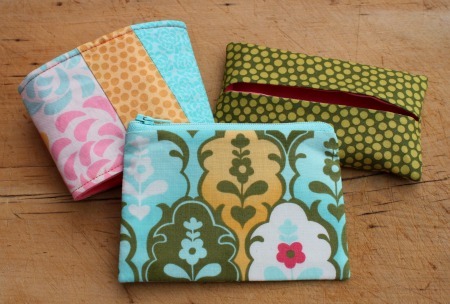 I am in love with the fabrics you used! I am in love with that adorable teapot and the sweet coffee cozy. What a great giveaway! What a great give-a-way! Thanks for the chance. I am so in! What a beautiful range of gifts..very generous..thank you Gwen. Wow, Gwen! You are so generous. I would love to win some of your homemade gifts! I love it all! Congrats on all your followers! You very much deserve it and more! How lovely! All for being a follower of your lovely blog! thanks! have a great weekend. Thanks for the chance to win some beautiful goodies! (I was a follower via google reader for months and am now a google follower.) Your blog is a great source of inspiration. I could use a zippered pouch like that! And I love the colors. The teapot is super-cute too. Thanks for the chance! Great giveaway Gwen! Thanks for the chance! I'm a follower! What a wonderful giveaway! I hope you know by now that I'm TOTALLY a follower already!!! What a fab giveaway you've put together. My fingers are crossed! How cute are your prizes! I am a follower already. So exciting!!! All fun stuff, and that teapot is just adorable! So purty and perfect for spring! I am very much a follower! Fairly new follower, but that pouch is pretty and the teapot! Too cute! I have loved following you for the last little bit. Happy Spring to you! Gwen, I happily follow your blog & appreciate all of your wonderful posts! I am a follower! I love reading your blog! I'm a follower and I would love love love to win. Thanks so much for the chance! Thank you so much for the opportunity to win such a cute giveaway! I'm a GFC follower! Wonderful contest! I would love to win! This is so fun Gwen! I love the teapot! the fabrics are darling. Now I feel like I need to go sew! Adorable giveaway Gwen:) That coffee cozy is adorable...love the pieced look. You did such a great job on the coffee sleeve and goodies--very adorable! Great Giveaway! I love the teapot! I've been reading your blog for awhile and really enjoy it. Finally became a follower. I have been following you and enjoy it! I cannot wait for spring!..sigh.. Thank you for your generosity! I love everything! Hope I win! Lovey our blog! One comment. (JK). The fabrics are absolutly beautiful. As usual. Love the teapot and was thrilled to see it was a pin cushion. Thanks for a chance to win these fabulous items! That teapot made me smile! I love the fabric you chose for your three handmade items, too. You have great taste!! I just found your blog and love it! I am your newest follower! From one Gwen to another, it's nice to meet you! Your homemade giveaway is wonderful, I joined in as a follower (Karen - Sew Many Ways) sent us over. Thank you for the opportunity, come "visit" me sometime! Oh, how beautiful. I just became a follower and love what you do. Can't wait to take a look around. I would so love to be gifted with these wonderful presents. I've about given up on winning anything but these are too beautiful not to try. Thanks for your generousity. I love everything in this giveaway. I just became a follower. Can't wait to read everything. Just found you, Gwen, at Karen's blog! You have such a nice blog. I've put you in my google reader and I've become a follower. Love those travel accessories that you made! Thanks for counting me in. I'm a new follower. I found you through Sew Many Ways. Awesome giveaway! You are very talented, and all these sweet items are perfect! Love 'em! What an awesome giveaway! I'm so glad I found your blog. Oh! I'm a new follower!! What a fantastic giveaway. I'm lovin the pincushion and the tissue holder. Lovin your stuff. Thanks for the generous giveaway. I'm a new follower. I loved the Groundhog day birthday theme. She looks like a cutie. My youngest daughter informed me today that yesterday was her half birthday and she is now officially 13 and one half. You have some really cute ideas. Glad I found your blog. Hope to win. I am a follower now! I love these cute things! OH my, I just have to have these. Karen at Sew Many Ways said I should. I need the pin cushion for all my pins (& I drink tea), the cup cozy to keep my Starbucks hot, AND it's PINK inside, and last but not least, I need the tissue holder because I sneeze ALL THE TIME! !, bad allergies! The zippered bag will hold them. Now don't you think I need them? Of course you do...Thanks.. What a cute giveaway! I love them all and I love the cute little teapot! 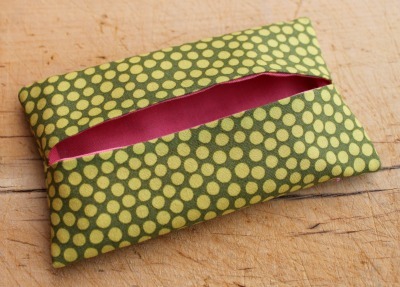 Thanks for a chance to win (and I am not following your blog - you have very cute projects - love your sewing wardrobe! Karen at Sew Many Ways sent me over and I am so glad she did! You have some great talent to share and I am happy to soak it in. :) Thanks for doing the giveaway! What a fantastic blog you have. Just found you and following for sure. Bookmarked your tutorials too (thank you for sharing). I would also love to enter your give away. Love your handmade items! I love that teapot pin cushion. Is it possible to have too many pin cushions??? Such lovely items! Glad I found your blog through Karen. So I am looking forward to follow you! What a treet to find your blog, and your having give aways, wow! An added bonus! Lovely giveaway. Your blog looks like it could give hours of fun! Hi Gwen my name is Sharon and I am following you now. You have a wonderful blog. Thanks somuch for the tuts on the lableing and the flass mosaic I would love to try both. Your tea pot is wonderful. If you get allot of people I will gladly share my winnings if I was choosen with another if you need, I am glad tomeet you and I will be back to visit. Such lovelies! This is a great giveaway because I collect buttons and pincushions! You've done a great job on the Tissue holder and coffee cup warmer...just too cute. Thanks for the opportunity. Thanks for giving me a chance to win. As a collector of pin cushions, I LOVE the teapot!!! I love, love, love your blog name! Seriously, I grew up being given the nickname "Henny Penny" (my first name is Heather) so I just laughed out loud when I saw your blog. I found your blog via Sew Many Ways, and boy, is that teapot amazing. Thanks for having this give away, I love having the chance to win coo stuff!! That teapot pin cushion is just the cutest. Do you know where I could find a pattern?? 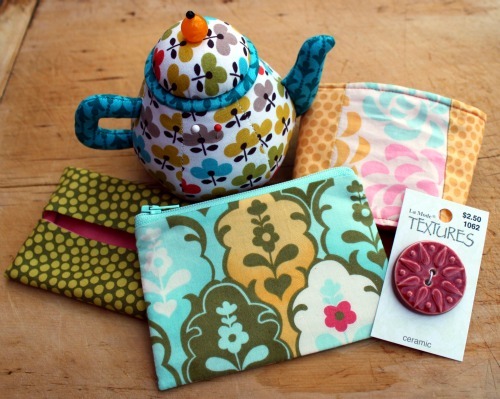 What a great giveaway ,that teapot is adorable and I love all the fabrics you've used .I'm a follower . I'm a new follower and love your blog! Hi! I just became a follower. Your blog is wonderful. Can't believe, with all the blog-hopping I do, that I hadnt discovered your blog til now. Thanks for hosting an awesome giveaway. I just found you through Sew Many Ways. I love your blog! I am a new follower! I am a new follower. (Thanks to Karen at Sew Many Ways). I love your blog. Can't wait to come back and watch all of your tutorials. These are adorable and such a springy reminder. As I look outside at the snow I can almost feel spring trying to pop out from underneath. I love the teapot pincushion! I love teapots. I haven't seen a pincushion one before. I'm a happy new follower thanks to Karen of Sew Many Ways. =) I look foreword to reading all your tutorials in the days to come. Thanks for the great give away! This is an awesome giveaway!! So many lovelies and that teapot is sweet too! I am a new follower and look forward to your future posts. Thanks! Love them. The colors are so bright! Wow, this is certainly an awesome giveaway.. whoo hooo! You are very generous such great goodies.. that teapot is beautiful! That teapot pincushion is SOOOOO CUTE! Is this a pattern or original design? I'm a new follower:) Looking forward to your blog posts. Have a great day! Your teapot is insanely adorable and so creative! I love the idea of a tissue holder too... would keep those plastic ones that come on the individually wrapped packages from coming apart in my purse and making a mess. What a wonderful bundle and what a wonderful blog! Those are all so cute!!! Big coffee drinker here and in love with that pot! :)) I follow as a RSS feed. Hope that counts! I'm a follower now! This is my first visit and I can't wait to see more! Thanks for the great giveaway! Wow, such creative and fun projects! Love your style! That teapot is just adorable! Thanks for the chance to win in this lovely giveaway. Your items are sew adorable! A friend referred me to your site and I love it! Being a new follower - I can't wait to see future blogging from you! Karen from Sew Many Ways sent me... what a wonderful give-away... thanks for the chance! Spent a little time reading on your blog and love your projects... so you definitely have a new follower in me! I am a follower and the items are useful and cheerful. Love the fabrics and I love tea pots. I'm a new follower. Thanks for the chance at your generous giveaway. Love the teapot pin cushion! I'm a new follower. I'm looking forward to seeing your projects. I love the coffee cozy! I loove that little teapot! I know Sadie would too! thanks for the awesome giveaway Gwen! What a wonderful give away! I just love the coffee cozy ! The teapot cushion is adorable. 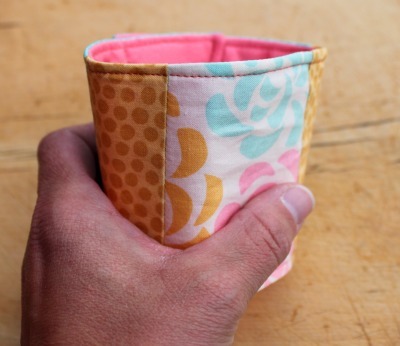 Your knack for sewing a coffee coozy is awesome! Such a cute idea :) Many java blessings to you!!! I found your blog through Sew Many Ways and just became a follower. Love the fabrics in the give away! They just say spring when you look at them! Just found you and I'm now a follower! Please enter me! I love all the items. I am a new follower! Love the fabrics so cute!! I found you through Sew Many Ways and love your blog. Thanks for the entry into your give-away! Thank you for your generosity, it is a lovely giveaway. Would love the teapot pin cushion. I am a new follower, I linked via Sew Many Ways. Thanks for the chance to win in your wonderful giveaway. I am a new follower. 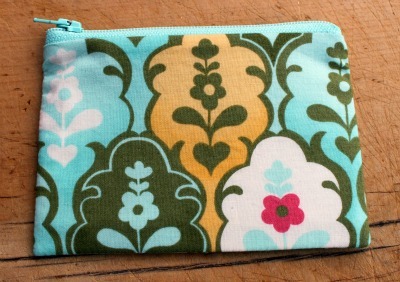 I have wanted to make those zippered purses for a while but they seem intimidating. Yours is very cute. 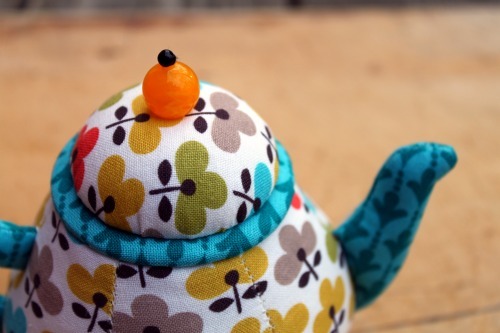 The teapot pin cushion is extra cute too. Stuffed teapot! Must have one. Totally love it! Karen from Sew Many Ways sent me here to meet you! I'm looking forward to seeing more of your creations! You are welcome to visit me at http://kayzquiltz.blogspot.com/ Thank you for the nice giveaway. Hey< Karen sent me here also. Great giveaway and great blog. Thanks for the chance to win. What a great site you have. I'm glad to be a follower. Thanks so much for the chance to win! I just found your blog today, and I´m in love already! What a cute site, and great tutorials! marsha433@bluemarble.net This is a great blog and since I have just come across it I will be on it daily. 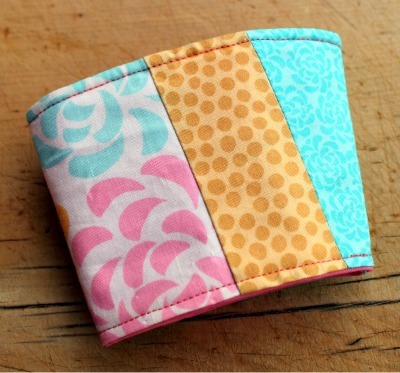 Thanks to Sew Many Things for directing me to this blog. I like everything you are giving away. I found your blog through "Sew Many Ways." What lovely itemas, I became a follower and now I'm going to have a look in your blog. The teapot is too cute! Creative and lovely. I'll be looking forward to reading your blog often! I found you from Sew Many Ways and look forward to reading your blog. Thanks for the giveaway chance! The teapot is adorable. I'm a new follower. I found you via Sew Many Ways. I'm a new follower, but not new to your nifty blog! Thanks for a lovely giveaway! I love all the things you are giving away especially the teapot pincusion. It is so cute!! I am a follower of your blog on google reader. I LOVE the teapot pin cushion! Thank you for taking the time to blog and share your ideas and now a give away!! What a great giveaway! I'm a follower. Thanks for the giveaway of your cute items. After reading through a few of the comments above, I'm glad to notice (yet again) that tea, crafting and blogging goes great with one another. And how every one simply lurvs the little tea pot. I actually tried googling to find something similar, but yours must be the only Dritz tea pot pin cushion on the planet. Or then I just couldn't find any others (except some that looked like tomatoes, but the tea pot beats them easily). I'm a new follower! Thank you for the amazing giveaway. Love your teapot pincushion. I am a new follower. Thank you for the giveaway. Adorable!!! I'm a new follower and looking forward to spending some time on your blog. ADOORable stuff!!!! thanks for the chance to win. I am a new follower, and I have to say you have a wonderful blog. Can't wait to browse some more. What a great giveaway. I'd love to win. I came here from "Sew Many Ways," and I like it so much I've subscribed! I am definitely going to enjoy it here! I came here from "Sew Many Ways". I am a new follower. Would love to win something. New follower! These are too cute! I am a new follower. So glad I found your blog. I look forward to looking around and returning ofted. New follower...love that teapot! Clever girl! New follower thanks to Sew Many Ways! I love the tea pot...so adorable! mi nick is clamaresa and I live in Bogotá Colombia. All items are adorable and I'd love to win! Am a follower. Love that teapot. I have a weakness for pincushions. I love TEA! fab giveaway!!! Gwen, this is an awesome & generous giveaway! Sorry I am just now seeing it but glad I didn't miss it! What a sweet give away.....yes, I am a follower! I LOVE the pin cushion!!! I'm a follower! Love your blog! I just found your blog and what a nice surprise to find a giveaway. Cute items you made and found. That teapot is the most adorable thing I've ever seen. Please do enter me in your generous giveaway! What a fabulous giveaway, Ihave never seen a pincusion like that it is absolutely adorable. The teapot is why I'm entering, but the tissue cozy would be most practical for me. :) All too adorable! Your little teapot is precious! I've been checking in on your blog for awhile now, but I just became an official follower. Thanks for the giveaway! I so need a pincushion and that teapot is adorable! Wow! What a great giveaway! That teapot pincushion is too cute! Holy comments Batman! I would just like to say that I was your first follower, if I remember correctly :-) Love this giveaway and this blog!! I am a new follower. Can't wait to explore your blog. It is very clean and fresh! I need this teapot! I love love love it! Great blog! I love everything. Thanks for the chance to win. My sewing table is in the kitchen so I need the teapot pincushion. LOOOVE each and every piece! Hi! I am still using the pincushion I made in Girl Scouts and I am 52 years old! 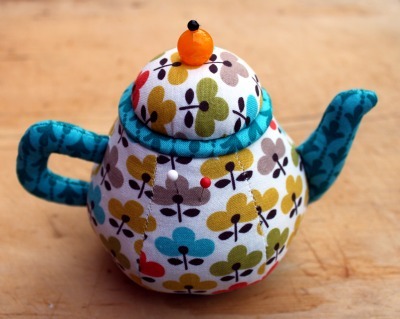 The teapot pincushion is adorable and it sure is time for me to have a new one! Oh! that things so charming!. I would be happy to participate. A big kiss and thanks for the opportunity. Que pena acabo de ver lo del sorteo y ya es tarde,hubiera sido un buen regalo de cumple, por que mi cumple es el 25 de febrero,es una pena. Me gusto conocer tu blog.